The Houston Texans are proud to announce a $750,000 pledge to the Boys & Girls Clubs of Greater Houston to build a new facility designed specifically for teens. In its longstanding partnership with the Boys & Girls Club, the Texans are honored to build a space that will exclusively serve Houston’s young adults. 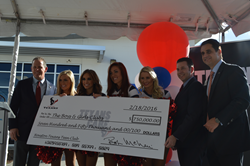 The $750,000 donation is the largest single donation to the Boys & Girls Club by a Houston professional sports team and places the Texans in the top five donors to the Boys & Girls Clubs of Greater Houston. The new facility will be the first Boys & Girls Teen Club in Houston and the first in the nation to be supported by an NFL team. Construction on the new facility will begin immediately as the new teen club is scheduled to open in July of this year. About Boys & Girls Clubs of Greater Houston: Since 1952, the Boys & Girls Clubs of Greater Houston, BGCGH, has been in the forefront of youth development, working with youth who need us most. BGCGH is dedicated to ensuring that the community’s young people have greater access to quality programs and services that provide promise, hope and opportunity. BGCGH operates 15 Clubs located in the most vulnerable neighborhoods in the Greater Houston region and serves more than 12,000 children and teens annually. For more information about the Boys & Girls Clubs of Greater Houston and our involvement with the Houston Texans, please visit http://www.bgcgh.org.